Who knew that I would post something this quickly! I was not planning to do a new one until tomorrow, but I jsut have to share this wonderful project/product that my fellow AoD graduate, Deb, has available on her blog. (AoD: the Art of Digital Design, a class about digi design from Jessica Sprauge). Deb designs under the name of Crafty Queen, and she really is a queen when it comes to design! 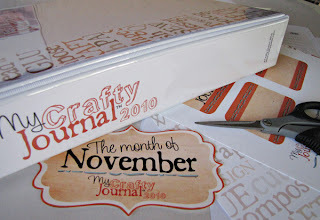 She has a project, or product, available on her blog called "My Crafty Journal"
I love the idea of having my own crafty journal to document ideas, projects and promts in, so I´ve just downloaded the January pages. I´m going to get them printed out, and then start the search for a proper binder for them!